I did what I thought I would never do. I signed up for a gym. Ugh, I know. I know. My happy place is in a doughnut shop, not a gym. But I think it's time I incorporated some fitness into my life. Plus this gym is three minutes away from my office. You can't beat the convenience. You know what else is convenient? Quinoa. It cooks in no time. Now, I'm not sure if this quinoa salad really counts as clean eats, but it's definitely close! It's lemon-y + tarragon-y. 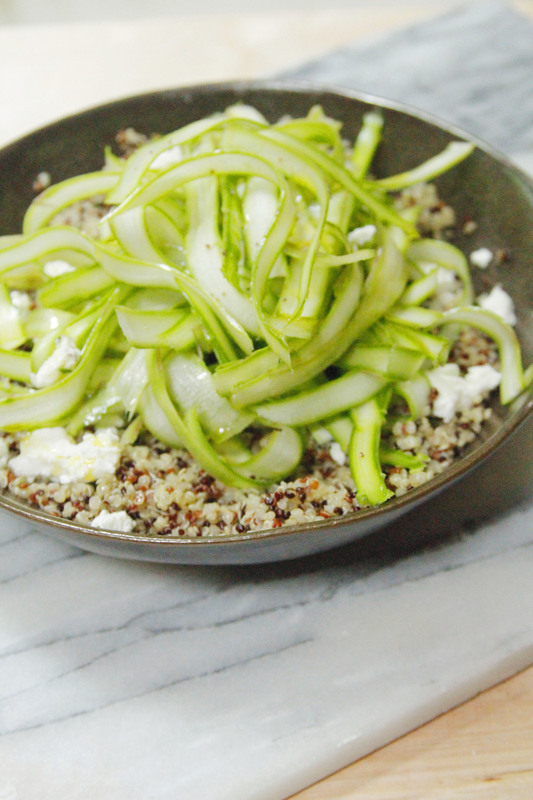 Basically it's a fresh, bright bowl of veg + grains which is perfect for post-workout eats. Give this one a try this week and let me know how it goes! Recipe is below. Start by cooking the quinoa according to the directions on your brand's package. Meanwhile shave the asparagus using a vegetable peeler. Shave from end to end. You'll have some leftover when you can't shave anymore, but feel free to use those for pasta or future sides. 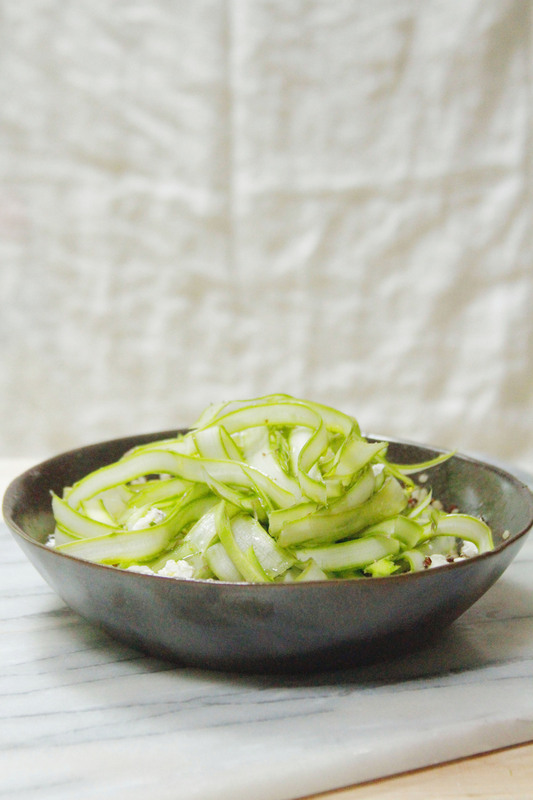 Keep the asparagus in a bowl filled with ice water to keep the shaved asparagus fresh before you prep the salad. Combine the tarragon, olive oil + lemon juice in a bowl. 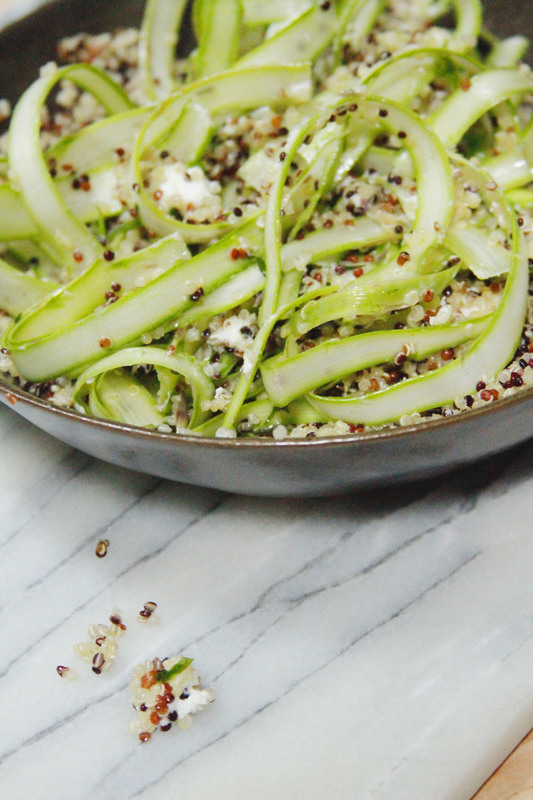 Add the cooked quinoa, (drained) shaved asparagus + goat cheese. Combine everything until throughly mixed + enjoy.